Twin Falls' urban trails are an excellent way to keep moving — and enjoy some surprising natural settings right here in town. The trail: A paved trail on the canyon floor connects popular, well-maintained Rock Creek Park with its companion RV park and follows the creek downstream. Allowed: Pedestrians, bicycles, skateboards and leashed dogs. No horses or motorized vehicles other than wheelchairs. Where to park: The two county-owned parks at the heart of this pretty trail mean you can drive right down into the canyon to start your stroll, with the amenities of a developed park close at hand. On Twin Falls’ Addison Avenue West — just west of the County West office building and the bridge over Rock Creek — turn north into either the Rock Creek Park entrance or the one for Rock Creek RV Park. Both lead directly into the canyon, entry is free and both tree-filled parks have plentiful paved parking, covered picnic tables, vault toilets, playground equipment and tended lawns. The two roads aren’t connected, however. • Another paved trail leads down from the small dirt parking lot at the south end of Grandview Drive North and joins the main trail near the RV park. • At the west end of Filer Avenue West, you’ll find another trailhead with unpaved parking. Here the grade that descends the canyon wall is loose dirt, so it’s not a good option for everyone, but the first and last holes of Rock Creek Park’s 18-hole disc golf course are here. This access joins the main trail near its west end, and it’s all asphalt once you reach the canyon floor. Trail length: From the east canyon-rim access point at the county offices, it’s a 1.4-mile walk to the trail’s western end, where it dead-ends beside the creek. You can add to the length with loops in both parks. The experience: On pleasant days, Rock Creek Park draws masses of anglers, picnickers, RVs, bikes, dog owners and family photo shoots, but you can find solitude on the trail's west end. There, you’ll find benches well away from the crowds, where birdsong and running water might provide the only sounds. And along that west stretch — from Rock Creek Park to the trail's dead-end just beyond the Filer access — the disc golf course challenges players with multiple locations for each hole, some strange terrain and a lot of water hazards. It’s a well-developed course, with concrete tee pads and detailed signs for each hole. Two drawbacks on this trail are occasional nasty odors from the creek and its swampy areas, and some badly broken asphalt. This spring the county parks department planned to tear out and replace the asphalt on a deteriorated section of trail between the Heider Pavilion and the RV park’s west bridge. But federal funding was delayed, and now Novacek intends to have workers start the repaving in September or October. Notes: The entire trail and both parks are unlighted — the pavilions are lighted only if they’re reserved — but you’re allowed to walk the trail any time of day or night if you want to. Drive-in park access has some limits, however. Rock Creek Park’s gates are closed between dusk and 7 a.m.; the park is open year-round unless the county has to close it for a day or two because of winter ice. Rock Creek RV Park is open around the clock from April 1 to Nov. 1, and its gate closes in the off-season. Be vigilant about monitoring children here; the creek’s water is swift, it isn’t fenced, and in places the dropoff is abrupt. Walking a dog? You’ll find garbage cans along the trail. And bring your own water. You won’t find drinking fountains. The trail: The Old Towne Parkway lies inside a 1.6-mile stretch of Rock Creek Canyon as the creek cuts through southwest Twin Falls. Thanks to an enormous canyon-cleanup effort by volunteers in the 1990s, this shady, quiet trail offers a rare urban retreat. Allowed: Pedestrians, bicycles, skateboards and leashed dogs. No horses or motorized vehicles. The experience: The wide, paved trail meanders along tree-lined Rock Creek, punctuated with benches. The canyon is narrow here, but brush is cut well back from the path and grasses are mowed in wide swaths on both sides. Occasionally the canyon widens enough for big grassy areas and picnic tables. Fences and factories are visible on the canyon rim, and you may hear trains and industrial equipment above. But you can lower your sights and lose yourself in birdsong, gurgling water and the laughter of kids with bicycles and fishing poles. Deer and ducks frequent the canyon, and the trees sport fall colors. Twin Falls’ parks director works out on the trail — running between the benches and doing tricep dips. Graffiti, however, mars the scene. The trail’s other drawbacks: some trash hanging from tree branches, occasional unsavory odors, no drinking fountains. And it’s advisable to stay off the canyon’s crumbling rock walls, where there remain some rusty remnants of Rock Creek’s less-than-pristine past. Where to park: Of the trail’s four access points, the one on Blake Street South (between Third Avenue West and DeLong Avenue) is the most welcoming, thanks to a patch of tended lawn and a portable toilet. The small, paved parking lot here means wheelchairs and walkers don’t have to negotiate dirt or gravel to reach the trail. At wet times of year, trailhead parking can be muddy at the end of Bracken Street (south of Addison Avenue West), and you’ll find space for only a couple of vehicles. You might encounter parking lot mud at the trailhead beside the Twin Falls Parks and Recreation Department on Maxwell Avenue, too. But parking is plentiful, and the trail’s only other portable toilet is there. Another access point, near the intersection of Fifth Avenue West and Washington Street, is hard to find. Look for a gravel driveway disappearing behind Superior Woodworking’s big, yellow industrial building. Don’t park in the large gravel lot beside that building; it looks like a parking lot, but it’s really a trucking company’s work area. (You’re likely to be yelled at, as I was.) Instead, follow the driveway down to a couple of spaces directly beside the trailhead. No matter which access point you choose, exiting the canyon means a climb. But long, paved grades let you do it gradually. Notes: The Old Towne Parkway is closed from sunset to sunrise. At the trail’s south end, stay on the pavement to avoid trespassing on private property inside the canyon. Walking a dog? You’ll find garbage cans here and there along the trail. The trail: Inside the Snake River Canyon, the Mogensen Trail runs along the river’s south side between the Centennial Waterfront Park entrance and a landing site for BASE jumpers east of the Perrine Bridge. Its name honors the late Frank W. Mogensen, a longtime Boy Scout leader. Hikers here are rewarded with intimate views of a river stretch most familiar to boaters. The canyon walls are gorgeous, and you won’t have to pay for kayak rental to see them. What to expect: This trail is only for the surefooted, and children need supervision here. Trail surfaces include loose dirt, boulders, scree, footbridges, steep stairs, wooden planks and mud. Expect some sharp dropoffs beside the trail. Overgrown trees and vegetation crowd the trail in places, and adults have to stoop to pass under bushes at one point. The Mogensen Trail is on private and Bureau of Land Management land, said Rick Novacek, Parks and Waterways director for Twin Falls County, which owns the nearby park. Scout groups did some trail maintenance this spring, he said. Still, the trail is more informal, by far, than Twin Falls’ other urban trails. Where to park: From Blue Lakes Boulevard North at the north end of Twin Falls, turn west onto Canyon Springs Road and drive down into the Snake River Canyon. Just outside the gated entrance to Centennial Waterfront Park, you’ll find a small, dirt parking area and a “Mogensen Trail” sign. The experience: This ramble in the canyon offers new perspectives on landmarks you thought you knew well. Right below the rim’s restaurants and subdivisions, this hidden spot still has a lot of wildness about it, too. Heading east, you’ll start off on a loose dirt trail through an untended mix of Russian olive trees, sagebrush, grasses, weeds and other plants. You’ll see evidence that someone cut back branches recently. As a rocky section of the trail descends to a lower shelf of the canyon bottom, a lovely view of the Snake River opens up to your left. And from your right, you’ll hear the first of many pleasantly burbling waterfalls. If you step off the trail to admire it, beware of an abrupt drop-off. Helping your descent you’ll have a long flight of metal steps, then a flight of steep wooden steps, reinforced with metal brackets. Numerous small waterfalls supply an almost constant soundtrack for the hike, and wooden planks cross gullies big and small. The river is often hidden from view, but you’re likely to hear voices from that direction; kayaking from Centennial Waterfront Park upstream to Pillar Falls is particularly popular this summer. And when the sound of falling water eventually recedes, it’s replaced by the rumble of traffic high above on the Perrine Bridge, which dominates the view ahead. If you hear the sharp swoosh of a parachute opening, look up quickly. And when you pass under the bridge, examine the south canyon wall; you might spot a BASE jumper climbing back up after a jump. Other BASE jumpers take the longer, easier way out on the Mogensen Trail; you’ll know them by the big parachute packs on their backs and the fresh-from-a-jump exhilaration on their faces. After hiking through a stretch of tall grasses, you’ll arrive at a big open area. That’s the typical landing site for BASE jumpers, and it’s marked by an American flag on a short pole — plus a bush, a plaque and strange collection of mementos. The plaque, donated by local BASE jumpers, honors men and women in the armed forces and the freedom to jump off a bridge. On an evening in early August, I saw a deer bounding across the landing site. It’s worth hiking beyond that to see the most dramatic waterfall yet, plummeting from the rim in long drops. But after the base of that falls, trail conditions grow markedly worse. You can continue a short distance, almost to the river’s edge, but it’s not a great vantage point there at the trail’s end. A better place for quiet time with the river is near the jumpers’ landing site. Look for a broken board on which is written: “Boat available. River Angel.” An arrow points toward the river, a grassy area and a rough, makeshift dock — a third way out for BASE jumpers. Safety notes: Thistles and stinging nettle are plentiful, so clothing that covers your legs and arms is a good idea. The trail isn’t gated, but get out before dark anyway. And come prepared: You won’t find any drinking water (or restrooms) here. The trail: This stretch follows the south rim of the Snake River Canyon from the Perrine Bridge toward the east, where a new trail extension offers great views of Pillar Falls. Wide asphalt trail all the way. Allowed: Pedestrians, bicycles, wheelchairs and leashed dogs. No motorized vehicles other than wheelchairs. Where to park: You have options here. The three best places to park for easy trail access are the east side of Sportsman’s Warehouse, the west side of Best Buy or the new visitor center just west of the bridge. At its east end, the trail connects with Pole Line Road in two places, but that portion of Pole Line has no good parking and is decidedly unfriendly to bicycles and pedestrians. The experience: This popular trail east of the bridge — like its counterpart running west from the bridge — is an easy place to get a quick taste of canyon-rim walking. You’ll see a lot of tourists photographing the canyon and the bridge or watching BASE jumpers. If you parked at the visitor center, your walk to the east will take you under the guts of the bridge, a massive and exhilarating sweep of metal that’s a Twin Falls icon. Don’t be surprised to see BASE jumpers hop over the rock wall under the bridge; some hike up from a landing zone on the canyon bottom. In the Snake River below, motorboats, kayaks and stand-up paddleboards pass on their trip between Centennial Waterfront Park and Pillar Falls. Above, raptors soar in long, slow circles, riding the currents. Though metal railings line the overlooks, much of this wide, paved trail is unfenced for unhindered views of the gorge. The rim is just a few feet away, so keep pets and children under control. As your walk to the east follows the rim, you’ll see the towering rocks of Pillar Falls appear upstream. With good eyesight or a long camera lens, you might spot boaters exploring the rocks at the base of the pillars as the river swirls around them — or someone particularly adventurous at the top of a pillar. The trail passes several houses before abruptly turning south to bypass an elaborate canyon-rim house. Until last fall, you had two choices: Consider this a dead-end and turn around, or continue south to Pole Line Road, which lacks sidewalks and bicycle lanes here. Now, a newly paved stretch of trail more than 2,000 feet long rejoins the rim after skirting the house and its gated driveway. Apparently, a lot of trail users haven’t yet discovered this extension, so you might have it to yourself. The adjacent lots are still an empty, weed-filled expanse, and the trail here is a wonderful place for watching the crowded airspace: the raptors and swirls of songbirds that love the canyon’s edge. The view of Pillar Falls keeps getting better, and that distant dirt mound on the rim is where daredevil Evel Knievel attempted his canyon jump. When you stop for photos, beware of splinters from the wooden fence that lines this trail segment. The trail swings south a second time, connecting with Pole Line near Eastland Drive and the Mormon temple. From there, walkers’ feet have created a narrow track toward the neighborhood to the east. But for most trail users, this is the place to turn around and enjoy the shifting canyon perspectives on the way back. Notes: You’ll find bathrooms and drinking fountains inside the visitor center and the lobby of Sportsman’s Warehouse, both open seven days a week. The visitor center serves free coffee. Best Buy, too, has fountains and bathrooms, but in the back of the store. East of the commercial area, the canyon-rim trail is unlighted at night. During the day, shade is scarce. Walking a dog? You’ll encounter a few trailside garbage cans, but bring your own bags for poop scooping; the bag dispensers are chronically empty. The trail: This loop begins in a neighborhood on the south rim of the Snake River Canyon, descends to Dierkes Lake, circles the lake and its park and climbs backs to the rim. Round trip is 2.8 miles. A mixture of concrete sidewalk, wide asphalt trail, gravel, stairs, narrow dirt track and uneven rock. A person of average fitness walking at a moderate pace and stopping frequently for photos can finish the loop in about 1 3/4 hours. Allowed: Hikers and leashed dogs. Technically, bicycles are allowed too, but you’ll almost never see one make the loop. To round the lake, a cyclist would have to carry the bike up and down stairs and rocks. And the trail segment between the rim and the lake would appeal only to cyclists with a taste for exceptionally steep asphalt and a high tolerance for risk. You can shorten your walk to about 1.7 miles by paying $3 to drive past the city’s toll booth on Shoshone Falls Grade, parking at Dierkes Lake Park and taking just the trail around the lake. That was your only option until 2012, when the city paved the trail segment leading down from the rim. The experience: From the north end of 3400 East, take the concrete sidewalk that heads directly north past homes and yards. Overhung in a few places by branches, the walkway veers left (west) to meet a road; turn right (north) onto the road. The road, too, soon veers to the west, but watch for another concrete path that heads north. For now it’s a surreal sidewalk heading into a sagebrush expanse, but lots-for-sale signs and the sounds of construction equipment suggest it won’t remain that way forever. Where the sidewalk ends, someone with chalk wrote “Paradise” on the concrete. Not a bad description. There begins a wide asphalt trail that rapidly descends the Snake River Canyon wall, revealing a pair of small lakes and their cacophony of bird calls. At the bottom of its descent, the asphalt trail meets a wide gravel trail that follows the south side of Dierkes Lake. This is a loop, so you can take it in either direction, but there’s a good reason to turn right. More on that later. Turning right takes you toward the quiet east end of Dierkes Lake, where on a weekday morning an angler in a boat might be the only person on the water. The main trail passes fishing docks at the east end of Dierkes Lake and crosses a creek on a picturesque footbridge before becoming a narrow dirt track often broken by rocks. Here you’ll come to something strange in this canyon setting: seven sturdy staircases climbing the basalt. These composite steps and metal railings replaced old wooden ones in early 2015 and eliminated the hazard of rickety steps. But between the staircases, you’ll scramble over rough rocks, which can be tricky if they’re wet or icy. For anyone who welcomes an easier climb, those seven staircases are an excellent reason to circle the lake counter-clockwise. At the top, a trail map and other signs guide you north, away from Dierkes Lake, then west, overlooking a long stretch of the Snake River and the north canyon wall. Here you’ll pass through the stumps of burned sagebrush, watch raptors slowly circling and sometimes encounter rock climbers. Except for a couple of excellent overlooks, you’ll be out of sight of Dierkes Lake and the noisy crowds of swimmers that populate it on hot days. Chance of solitude: high. This north stretch of the dirt trail descends slowly, using four more staircases. At the west end of Dierkes Lake, you’re likely to find more people — hikers, dog walkers, anglers, families. The trail takes you past a pleasant little waterfall in the rocks then breaks into numerous dirt tracks. They all lead toward the lake’s parking lot. There a wide gravel trail resumes, skirting the lawns, playground equipment, picnic tables and swimming docks of Dierkes Lake Park. Here on the south side of the lake, you’ll almost certainly see fat rock chucks scurrying across the trail. After finishing your circle of the lake, you’ll climb back to the canyon rim on the same asphalt trail that brought you down. “That gets your heart going and your legs burning a little bit,” said Dennis Bowyer, the city’s Parks and Recreation director. Well said. It’s a steep trudge uninterrupted by benches or shade trees. But the view is glorious. Notes: The trail is unlighted; get off before dark. The only garbage cans and restrooms along this trail are in Dierkes Lake Park. The trail: Centennial Trail runs from Shoshone Falls Park up to the Snake River Canyon rim, and west along the rim to daredevil Evel Knievel’s jump site. About 1.5 miles. Wide asphalt trail. Allowed: Pedestrians, bicycles, wheelchairs. No motorized vehicles other than wheelchairs. The city extended the western end of this trail last fall, so you now have a second — but informal — trailhead option. Park at the north end of Hankins Road North and walk straight north to Knievel’s dirt ramp. The city plans eventually to build both a parking lot at the end of Hankins and a trail or road north to the jump site, said Dennis Bowyer, Parks and Recreation director. 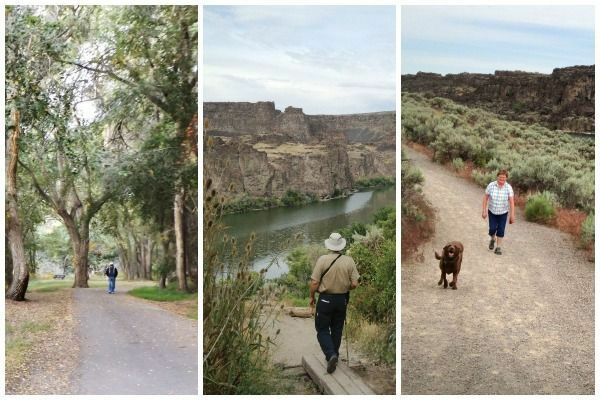 The experience: This decade-old stretch of walking trail — built as the city celebrated its 100th birthday — revealed Snake River Canyon vistas unfamiliar even to most longtime residents. The trail begins at the upper west side of Shoshone Falls Park, where barriers block the road to vehicles. As it climbs about 250 feet, the paved trail zigzags along shelves of the canyon wall, sometimes edged on the other side by wooden fence or metal railing. Overlooks offer dramatic (sometimes wet) perspectives of Shoshone Falls. Water trickling down the trailside wall attracts birds and adds a layer of sound to the ever-present roar of the falls. The upper portion of the trail, far enough away from the park to erase most of the parking lot and groomed lawn from sight, offers solitude in the sagebrush. At one overlook, a rock bench in a tree’s shade provides respite from sun. Another bench rewards walkers and cyclists who reach the canyon rim. The trail follows the rim west through open desert, gently rising and dropping. Only big electricity poles mar splendidly long views of the canyon. The city paved another 650 feet last fall to bring the trail’s west end to the ramp where Knievel made his famous attempt to jump the Snake River Canyon. The trail runs between the ramp and the canyon, and this spring the city erected fencing between the trail and the rim. Climb onto Knievel’s ramp for good views over the city — and, of course, for a Facebook post your out-of-state friends can envy. Though the city owns the jump site now, the rest of the rim land south of the trail is private and will be fenced off eventually — perhaps this year, Bowyer said. An interesting detour: On the rim, this trail passes beside a trio of man-made settling ponds circled by at least a mile of gravel trails and planted with rushes, native grasses and poplars. You’re likely to see ducks on the water or red-winged blackbirds in the rushes. It’s a wildlife haven now, but the wetlands had a more mundane reason for being. Environmental permits for the city’s sewage treatment plant set limits for suspended solids in the treated water pouring into the Snake River. To offset those limits, the city partnered with Twin Falls Canal Co. in 2011, building these ponds to remove sediment from irrigation waste. Don’t swim or throw objects into the ponds. Don’t let your dog swim, either, which would disturb sediment held up by the pond vegetation. And, of course, don’t drink the water. Adjacent to the Centennial Trail Ponds is a police gun range. The racket can be unnerving to walkers when officers have shooting practice, but pedestrians on the trails are in no danger. And practice isn’t frequent, so the ponds are usually an exquisitely quiet place to enjoy big sky and open space. Notes: After leaving Shoshone Falls Park, you won’t find restrooms or drinking fountains along the trail, and it’s unlighted after dark. In daylight, shade is scarce. Walking a dog? You’ll encounter a few garbage cans, but bring your own bags for poop scooping. The trail: From Twin Falls’ Federation Point, east along the Snake River Canyon rim and south along Perrine Coulee. Where to park: There are two official access points for this prime stretch of trail — a small parking lot at Federation Point, which is at Washington Street’s north end, and parking spaces behind Les Schwab Tire on Pole Line Road. Also, three restaurants that line the trail — Elevation 486, Canyon Crest and Montana Steak House — are informal entry points; the first two have wheelchair-accessible ramps. The experience: The Federation Point trailhead, a pretty spot beside an enormous power transmission tower, overlooks a stretch of the Snake River, a golf course, dramatic canyon walls and the distant Perrine Bridge. Near the trailhead, a fence-mounted box dispenses dog-poop cleanup bags; you’ll find several trash cans along the trail. Walking east along the Snake River Canyon rim, you’ll pass more canyon overlooks, trailside benches and tailored business landscapes that alternate with empty dirt lots. Though I’ve sometimes caught whiffs of the sewage treatment plant in the canyon, that smell was absent in early November. One overlook provides a superb view of Perrine Coulee spilling into the Snake River Canyon, with the bridge and a wide expanse of the gorge in sight, as well. The canyon views from the trail are, arguably, better than those from the famous bridge. Much of the trail is edged — on the rim side — by decorative iron railings or picturesque log-rail fences. But in other sections the ragged, rocky rim is unguarded, so keep children and dogs away from it. Behind the Canyon Crest event center, you’ll encounter a closed section of trail, washed out by August’s dramatic flooding. Behind a barrier of orange netting, broken railing dangles over the canyon rim. Bypass that section with a short detour on Canyon Crest’s sidewalks and through its gravel parking lot. The detour includes a short ramp of loose dirt. Back on the paved trail, the sound of tumbling water signals your approach to the Perrine Coulee’s dramatic fall into the canyon. After a tree-shaded footbridge across the coulee, the trail continues east briefly before dead-ending. Even at the east end, walkers can still hear pops from the gun club near Federation Point. At the coulee footbridge, walkers and cyclists also can opt to turn south and follow the paved trail to Pole Line Road, where a pedestrian underpass delivers them to the sidewalks on Pole Line’s south side. Notes: Many stretches of this trail have no lighting at night. Keep pets on leashes. The only restrooms or drinking fountains you’ll find are inside business lobbies. A paved trail on the canyon floor connects popular, well-maintained Rock Creek Park with its companion RV park and follows the creek upstream. The walking trail at Rock Creek Park, photographed July 20, leads past picnic tables, restrooms and grassy lawns. The centerpiece of Rock Creek Park, of course, is the creek running through it. A couple walks the creekside trail west of Rock Creek Park on July 20. Rock Creek Park's trail leads through a disc golf course with challenging terrain and many water hazards. Following Rock Creek as it cuts through southwest Twin Falls, the Old Towne Parkway offers picnic tables, benches and a number of open, grassy areas inside the canyon. The Old Towne Parkway passes under railroad tracks, as well as several bridges. Trail users on the Old Towne Parkway can see industrial buildings on the Snake River Canyon rim above them. Patricia Botkin walks her dog, Thor, beside the Old Towne Parkway on Oct. 8, relishing a natural area accessible on a paved trail. ‘It’s so nice that people with disabilities can still enjoy this,’ says Botkin, who lives in a motel room and doesn’t like to keep Thor cooped up. In a list of prohibited activities, the word ‘firearms’ is painted out on signs for the Old Towne Parkway. Hikers on the Mogensen Trail, which runs along the south side of the Snake River between Centennial Waterfront Park and the Perrine Bridge, could watch evening boaters on the river Aug. 3. A family uses a flight of metal steps and another of steep wooden steps to descend farther into the Snake River Canyon along the Mogensen Trail on Aug. 3. In many places on the Mogensen Trail, wooden planks cross chasms large and small. The Perrine Bridge, spanning the immense Snake River Canyon, is visible from most of the trail. BASE jumpers use the Mogensen Trail on Aug. 3, 2015, to start their trip out of the canyon after leaping from the Perrine Bridge. The Mogensen Trail begins in a small, dirt parking lot just outside the gated entrance to Centennial Waterfront Park. Several spots along the Mogensen Trail offer splendid, intimate views of the Snake River. A long wooden footbridge on the Mogensen Trail is an ideal spot for lingering to admire the Snake River — for people not bothered by the dropoff below. The Mogensen Trail runs along the south side of the Snake River between Centennial Waterfront Park and the Perrine Bridge. The Perrine Bridge is visible from many parts of the Mogensen Trail in the Snake River Canyon. The Mogensen Trail runs along the south side of the Snake River between Centennial Waterfront Park and the Perrine Bridge. Here, a short side trail brings hikers closer to the river. The Perrine Bridge is visible from many parts of the Mogensen Trail in the Snake River Canyon. Here, a hiker stops to look at a trailside waterfall. Frequent waterfalls provide the soundtrack for the Mogensen Trail — before the sound of running water is replaced by the rumble of traffic on the Perrine Bridge overhead. Several spots along the Mogensen Trail offer splendid, intimate views of the Snake River on Aug. 3. On the Mogensen Trail in the Snake River Canyon, a flag, a plaque and mementos mark a landing site for BASE jumpers. This waterfall cascading from the Snake River Canyon rim marks the end of the Mogensen Trail. The Perrine Bridge is visible from many parts of the Mogensen Trail in the Snake River Canyon. Here, the evening sun lights up thistles going to seed. At the north end of Twin Falls, a canyon-rim trail extension paved in fall 2014 offers a new perspective on Pillar Falls. Lined by a wooden fence, this new trail extension bypasses a big house before leading east toward Pillar Falls. Where the trail on the Snake River Canyon rim passes under the south end of the Perrine Bridge, people line up to watch BASE jumpers take the leap. As the trail east of the Perrine Bridge leaves a commercial area, you’re likely to see raptors circling above the canyon rim. On its east and north sides, the trail around Dierkes Lake offers a high chance of solitude. Here, an angler in a boat has the water to himself on the morning of June 5. Bernice Smith of Twin Falls, walking with her dog, Ladee, on June 5, is a frequent user of the Dierkes Lake trail. ‘It’s close. It doesn’t take very long to get here,’ she says. This map shows the trail around Dierkes Lake skirting a couple of large homes that overlook the lake from the northeast. Rail fences keep hikers from trespassing. Eleven sturdy staircases climb or descend the basalt around Dierkes Lake. These composite-and-metal steps replaced old wooden ones in early 2015. In 2012, the city built a steep trail segment leading down to Dierkes Lake from the Snake River Canyon rim. At the west end of Dierkes Lake, a trail map shows rock climbing and bouldering destinations. At this end of the lake, near a parking lot, you’re likely to encounter heavier trail use. The Dierkes Lake trail offers a couple of options for a detour to Hidden Lakes — on either a twisting dirt track or a wide, easy trail. At the west end of Dierkes Lake, a trail map shows rock climbing and bouldering destinations around the lake. The Centennial Trail departs from the upper west end of Shoshone Falls Park. Below the Centennial Trail, water from three settling ponds spills into the Snake River Canyon — a counterpoint to the mighty Shoshone Falls beyond. A bench rewards Centennial Trail users who finish the climb to the Snake River Canyon rim. An overlook platform beside the Centennial Trail offers a wider perspective on Shoshone Falls than you can find in the park below. Wooden fences guard many stretches of the Centennial Trail as it climbs out of the Snake River Canyon. Gravel trails around three ponds offer an interesting detour from the Centennial Trail, as well as an opportunity for bird-watching. A sign beside the Centennial Trail displays a map of wetlands built in 2011 on the Snake River Canyon rim. The canyon-rim trail that runs east from Twin Falls' Federation Point offers great views of the Snake River Canyon and the Perrine Bridge. Several restaurants overlook the canyon-rim trail that runs east from Twin Falls' Federation Point. Here, Elevation 486. Flood damage interrupts a section of the Twin Falls trail that runs east from Federation Point. But a short detour on restaurant sidewalks puts walkers back onto the trail. From Twin Falls' westernmost canyon-rim trail, a pedestrian underpass delivers walkers and cyclists to the sidewalks on Pole Line Road's south side. Stunning overlooks dot the canyon-rim trail that runs east from Twin Falls' Federation Point. This is great for sending friends and relations to show off and give them an idea of what Twin Falls has to offer. A minor request would be to delete dots that don't have photos attached, lest recipients think that's the end and not see all the other great places, too.